Can meeting planners find YOU? You can't possibly book any speaking engagements if meeting planners don't know you exist. 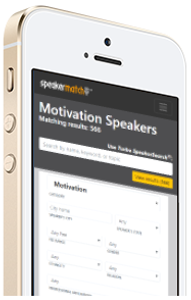 Set up your SpeakerMatch Profile today so you can BE SEEN! Somewhere Out There, A Meeting Planner Is Looking for YOU! We understand how difficult it can be to run a speaking business. Half the battle is being seen. Build a Robust Speaker Profile in Minutes! You provide your content, we'll do the rest. There's no need to pay for expensive web hosting, design services, and SEO specialists. We'll handle it all for you! Here's a little secret: be sure to use descriptive, image-evoking language that communicates how you are unique. Meeting planners want something special, just like you have to offer. Make sure they know what you bring to the table platform. Be FOUND. 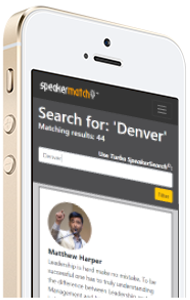 With a listing in the SpeakerMatch directory AND the eSpeakers Marketplace (included for free), meeting planners can find you easily. Our Turbo SpeakerSearch Directory tool helps meeting planners find you FAST. Leads are sent right to you! You'll have a place to show meeting planners a complete picture of who you are, what you have to offer, and what benefits make you unique. Not only can meeting planners find you, but you can find them. Our marketplace connects people who would not otherwise know about each other. For job leads, we'll let you know where each job is located, when, how much the planner is willing to pay, whether or not expenses are reimbursed, and more. You decide if you'd like to apply for an opportunity, and can apply online instantly. 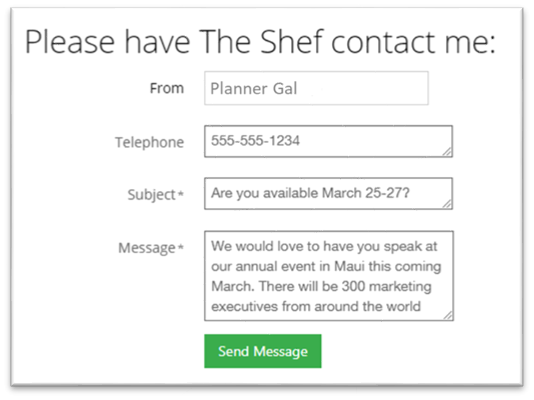 You communicate directly with the meeting planner -- no middlemen! *If you're (1) not earning a full-time living through speaking, and (2) you aren't earning at least $5,000 per speech, we consider you to be an "Emerging" speaker. We are grateful for your excellent service... saved us so much time, provided excellent speaker candidates, the audio clips are a real plus, and the links to the speaker's web sites, e-mail, and the applicant cover letters are all excellent. Thanks so much for your help! We have actually booked a couple of terrific people offering to come and speak to our humble group from your site! Thank you so much! This is going to be one of our most interesting years ever thanks to SpeakerMatch! Want to see what other clients are saying? It's as easy as plugging in your information. We do the rest! 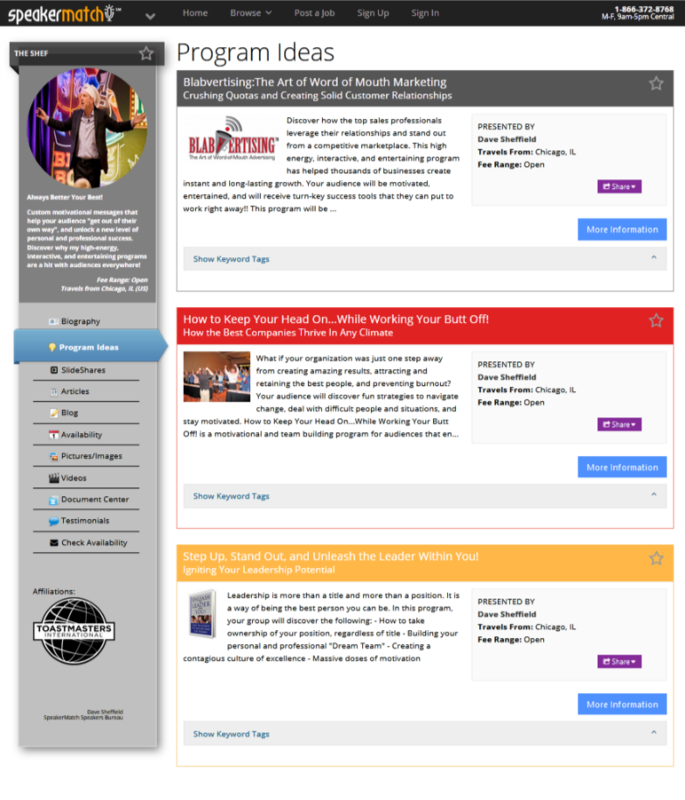 Highlight your programs, audios, videos, and more! 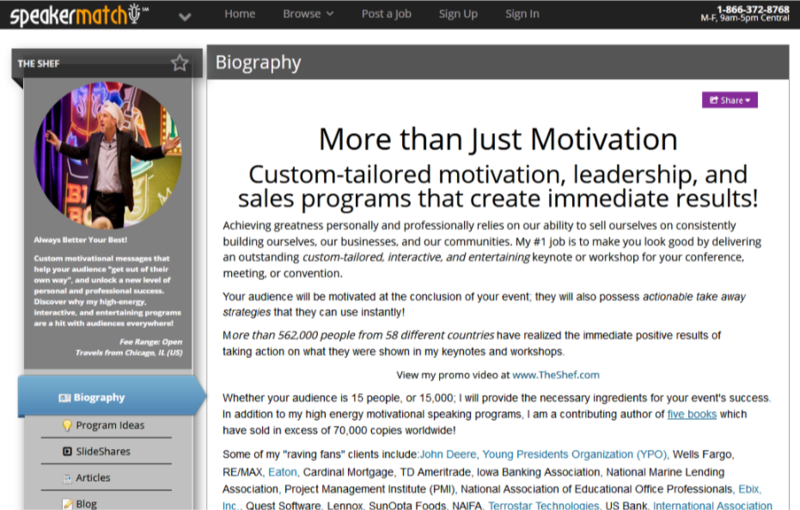 We give you tools that make it simple to create a professional looking profile. It's like having your own website with the added bonus of built-in traffic. 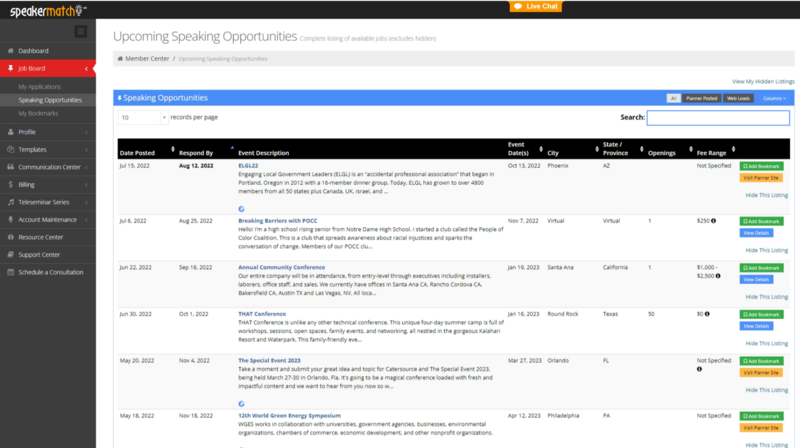 We've got a complete online job board and application system made just for speakers. 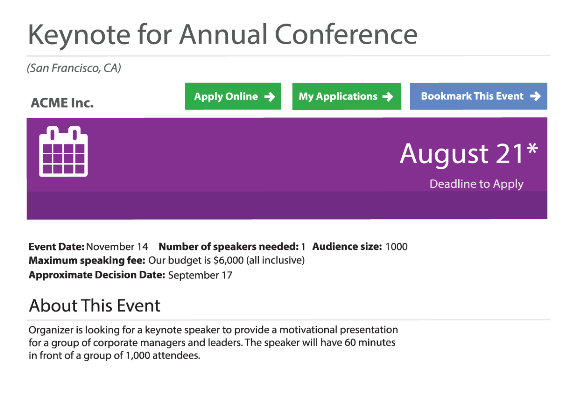 You will receive direct requests from meeting planners as well as open calls for speakers. And you can search our online database for more opportunities. 31 out of every 32 people who try to launch a speaking business fail. We want you to be in the successful minority. To help you succeed in the speaking business, we provide you with the resources to help build and maintain a successful and sustainable speaking business. In addition to helping meeting planners find you, we help you learn about speaking opportunities. You can only get a job if you know about it. 1. Direct Requests. Meeting planners hand-select candidates. They contact you directly with a job opportunity. If a meeting planner sees something they like in your profile or program listing, they can contact you directly. Most speakers get booked this way. We give you all the tools you need to create a compelling, search-engine-optimized profile. 2. Job Board Postings. Every member may apply to all jobs posted here. Contact planners through our online message board. Search anytime for an opportunity that fits your expertise and apply directly for any opportunity online with a click. Some meeting planners prefer to cast a wider net for candidates. When they post a speaking opportunity here, you still get notified so you can apply online. Wondering about your odds? On average, less than 10 speakers apply for any particular job. 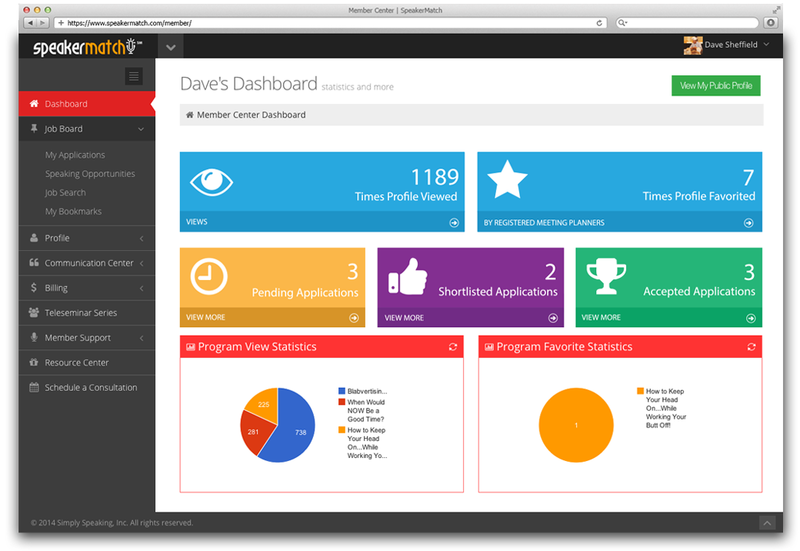 Your Member Center Dashboard is at the center of it all. We've got TONS of great functionality! Or only $329 billed annually! Or only $499 billed annually! Or only $799 billed annually! First-time subscribers: Use the SpeakerMatch service for up to 8 weeks at absolutely no risk. If you are not completely satisfied with the value of service you receive, just let us know before the end of this period and we'll promptly refund your full investment. Do you have any questions regarding our service plans? We'd love to hear from you! Contact Us. Join our mailing list to receive tips, resources, and special offers! * Of course we hate spam. If you need assistance with anything, or if you have any questions, we're here to help! You can reach a live person at 512-372-8768, Monday through Friday between 9am and 5pm Central time. Get Tips, Advice, and Offers! Not ready to become a member? Let us know how and we'll stay in touch! We'll send you tips, advice, industry related articles, special offers, and sneak peaks of available speaking opportunities in real-time! An error occurred during registration. Please try again later. An error occurred while trying to resend your beta code. Please try again later. NOTE: We value your privacy. You can unsubscribe at any time. Thank you for registering your email! We'll keep you in the loop when it comes to anything and everything SpeakerMatch! © Copyright 2019, Simply Speaking, Inc. All rights reserved.